If you would like to join WSJU Radio, come visit us in Marillac Hall room 424 during the school year. We accept new members all throughout the semester, so please feel free to speak to one of our staff members at the station. We’ll show you the ropes. 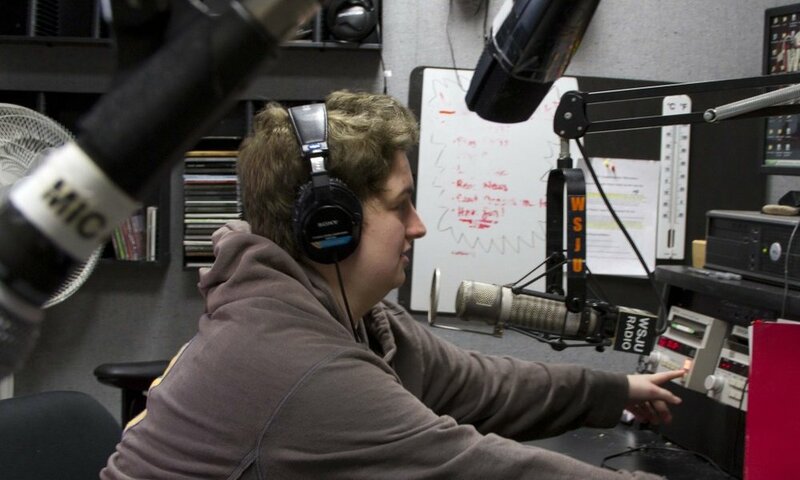 WSJU Radio is a St. John’s University co-curricular organization that is open to St. John’s University full-time undergraduate and pharmacy students. You must have a GPA of 2.0 or higher, and meet the WSJU requirements for membership. No, you do not have to be a Communications Major to join WSJU. Majors of every kind are welcome to join the station. The staff members of WSJU radio change on an annual basis. Since only current students of St. John’s University are allowed to be members, we often lose members due to graduation or transfers out of the university. Therefore, the process of electing new members to staff positions is a rolling process. WSJU Radio is always looking for new members to fill in every position - NO POSITIONS are permanent. When we say “there is a job for everyone,” we mean just that. You do not have to be a board member of WSJU radio to be a part of our important daily operations and routine station activities. Our board members and general members will always find a way for you to take part in working at WSJU Radio. Along with that, you can also become a member and receive training for any and every position on our board. Yes, all of our DJs would be more than happy to take your requests. We would also be happy to “shout out” people on air as well as make song dedications for you. No, when we first receive your call it is off-air. We understand not all listeners want to go on air, therefore we can play the request without putting you on the air. Should you want to be on air, please ask the DJ hosting the current show. Yes, you can call us at (718) 990-3758. Please note: if your call is not immediately answered, please try back shortly after. Our DJ or On-Air Personality might be LIVE on air when you call. You can also request a song by tweeting at us, @WSJUradio. WSJU is a variety college radio station. We do not strictly stick to one specific format. We have many different Music Departments including: Alternative, Blend, Indie, Urban and Reggae. WSJU Radio is a college radio station. Our on-air format, content, and ethics follow those of the Federal Communications Commission (FCC). We also broadcast while keeping in mind that St. John’s University is a Catholic Vincentian University. We do not broadcast any content that goes against the beliefs or opinions of St. John’s University and the mission our University follows. Our content is also based on the regulations set forth by the St. John’s University office of the Dean of Student Life. WSJU Music Department is dedicated to discovering new artists. Under the leadership of our two music directors, our six genre directors would be more than happy to listen your your demos or albums. Please send your music to the appropriate director. You can find the correct department to e-mail on our Contact Us <http://wsjuradio.com/contact> page. You will also find all of our information about mailing us CDs or Demos. Please do not e-mail us music files for internet safety & security reasons.